The Chesapeake Bay is a natural treasure every Maryland citizen cherishes and wants to protect. No one understands this more than Maryland farmers. Recently, there seems to be more misguided information and biased views on the effect chicken and dairy manure may have on the environment. For example, recent commentary in the Maryland Reporter by Tom Horton claims that outbreaks of toxic algae caused fish kills and memory loss in humans along Eastern Shore waterways, back in 1997. Jim Perdue from Perdue Family Farms said it best in a recent article, “Let’s not go back to ‘Pfiesteria Hysteria’ days,” where the scientific community debunked this claim and the claim that chicken manure was responsible for the fish kills. The Horton argument that nothing has been done to control phosphorus on farms until now is simply wrong. Phosphorus is not “pouring” into the Chesapeake Bay from farm fields. In fact, farmers have already made tremendous progress in phosphorus reductions. 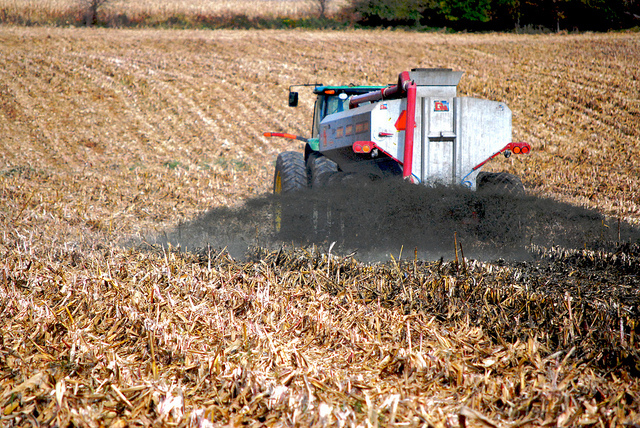 Working with extension researchers, farmers have reduced the amount of dairy manure and poultry litter applied to fields. What started out as 15 tons of litter to the acre decades ago, was reduced to 5 tons per acre in the mid-90s. Under the original Phosphorus Site Index used since the early 2000s, most farmers apply at the crop removal rate of 2 tons every 3 years. Like any industry, best management practices (BMPs) on farming operations take time to develop and implement. Through numerous conservation practices, Maryland farmers are stewards of the land, water and air. In the past few years, they have implemented a variety of conservation programs and practices on their farms, including cover crops, irrigation management, nutrient management plans, etc. Planting cover crops is one conservation practice farmers in Maryland use to sustain Maryland’s environment. Planted after the fall harvest, cover crops help to absorb unused plant nutrients that remain in the soil and prevent erosion over the winter months. Cover crops improve soil productivity and protect water quality in the Chesapeake Bay and its tributaries. Maryland farmers also practice the conservation method of irrigation management to determine and control the volume, frequency and application rate of irrigation water in a planned, efficient manner. By increasing our irrigated acres, we’re securing long-term benefits to the environment. Irrigation allows farmers to apply specific nutrients to certain areas of their crops as they grow through the season. This enables the crop to utilize all the nutrients and virtually eliminate the risk associated with a drought. Research has proven irrigated crops actually mine the soil of nutrients, thus helping reduce the issues of legacy phosphorous. Farm-specific nutrient management plans ensure that our farmers are applying the correct amount and form of plant nutrients for optimum yield and minimum impact on water quality. These plans were mandate by the state in 1998, under Gov. Paris Glendening. Nutrient Management Plans are especially important for Maryland farmers because they are in the Chesapeake Bay watershed and want to make sure the bay is clean and sustainable. These plans reduce the potential for nutrients to wash or infiltrate into water supplies and protect Bay water quality by preventing over-application of commercial fertilizers and animal manure. Nutrient Management plans are tested and updated every three years to stay current with farmland and scientific research. Furthermore, Governors Ehrlich and O’Malley made sure additional resources were made available to the farming community to implement additional BMPs including cover crops, manure storage, and streamline fencing. The most recent analysis by the EPA Chesapeake Bay Program office shows that Maryland is on target to meet the 2025 Bay restoration goals. In fact, we are ahead of schedule. A look at the agricultural sector shows that Maryland farmers are reducing nitrogen, phosphorus and sediment. Farmers are now faced with the PMT and its implementation. High risk fields will be addressed immediately. Over the next seven years, phosphorus use on cropland in the medium and low risk categories will be scaled back as the agronomic and economic impacts continue to be evaluated. Critical to the implementation of the new phosphorus program is the development of alternative use or treatment technologies. Maryland farmers look forward to working with Gov. Hogan and legislative leaders to bring new technologies for alternative use to fruition in Maryland. They know action must be taken by farmers so that we can continue to be leaders in conservation practices that protect the Bay. Maryland farmers have been ahead of schedule at every point in the Bay restoration progress evaluation. We have reduced phosphorus use tenfold over the last decade and continue to be leaders in Bay Restoration.